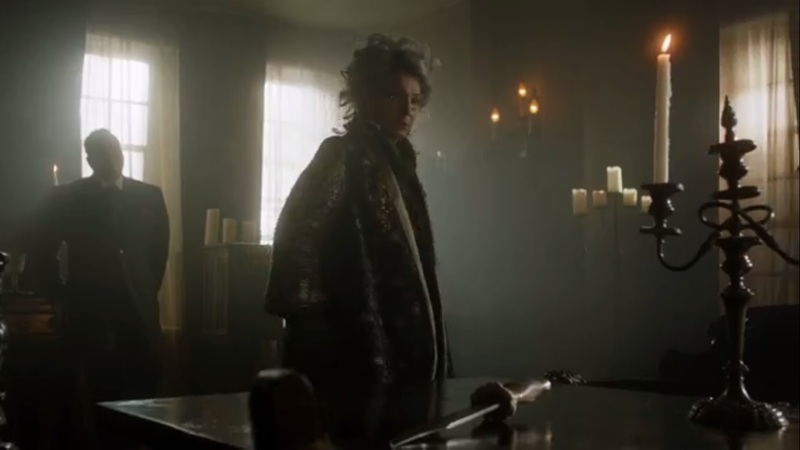 A Look at Gotham- Season 2, Episode 5: “Rise of the Villains: Scarification” | What Else is on Now? Firefly has finally returned to Fox. Well, not really. 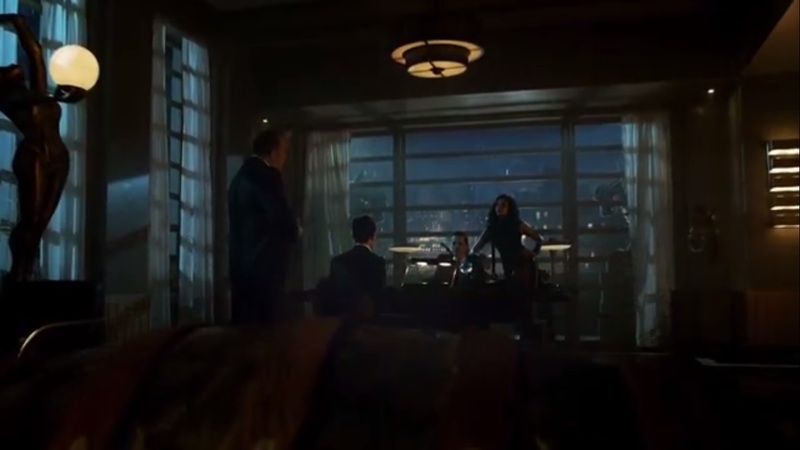 The episode begins in Theo Galavan’s tower of terror. Penguin has arrived with a trunk and is glad that Theo calls him a friend, even though it’s a figure of speech. Penguin feels he will be of much more use to Theo as a friend and ally. If he wasn’t worried about his mother, he’d be a better tool and would do his bidding. Mom just needs to be released. Even Butch knows who’s boss. Tabitha wasn’t listening. But Theo’s answer is still no, so off Penguin goes. He and Butch retreat, but not before Theo tells him to stay by the phone. Meanwhile, Theo needs a bored Tabitha to play her part. So who’s inside the box? Sid Bunderslaw, who recognizes Theo Galavan. Why? He’s the garbageman for Wayne Enterprises and he’s going to tell everything that he knows. There’s torture later if he refuses. For now, Theo needs to borrow something from Sid. Tabitha asks left or right. She approaches Sid and pulls out a blade. The rest you can guess. We then cut to men counting money in one of Penguin’s count houses. The operation is soon broken up by the GCPD and Strike Force. But like most gun fights, someone remembered to bring a rocket launcher. Really? Even Barnes is surprised, but this is Gotham City. Strike Force bags the money, which equates to $2 million- a strong blow to Penguin. Whoever gives up where the rocket launcher came from gets to keep their pants. Jim tells Barnes about a place called the Merc that supplies weapons. They haven’t been hit because the supply the City Council. So time to hit the Merc. This means no one gets pants. Penguin rages to Butch. They need an idea. Even if they Penguin gets Tabitha, he doesn’t think that Theo loves her as much as Penguin loves his mother. It’s a bad night that gets worse when Penguin learns that one of his locations has been hit. You know the saying ‘Don’t kill the messenger’? Penguin takes his anger out on the poor messenger before inspiration strikes and he gets an idea. At GCPD, Leslie speaks with Jim, who is in a good mood. Strike Force is going out on another raid. As for plans tonight, Jim wants to sleep, but he can’t since it’s date night. As if on cue, Nygma, shares that he’s been dating Miss Kringle, who mentioned that it would be nice to go out with other people. 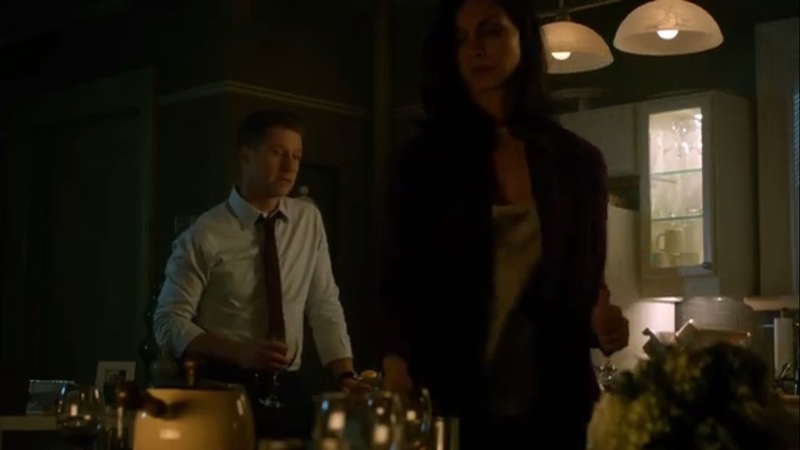 Hence, Nygma wants to invite the two to dinner. Leslie even got some new fondue plates. Jim can think of a thousand other things he’d rather do. 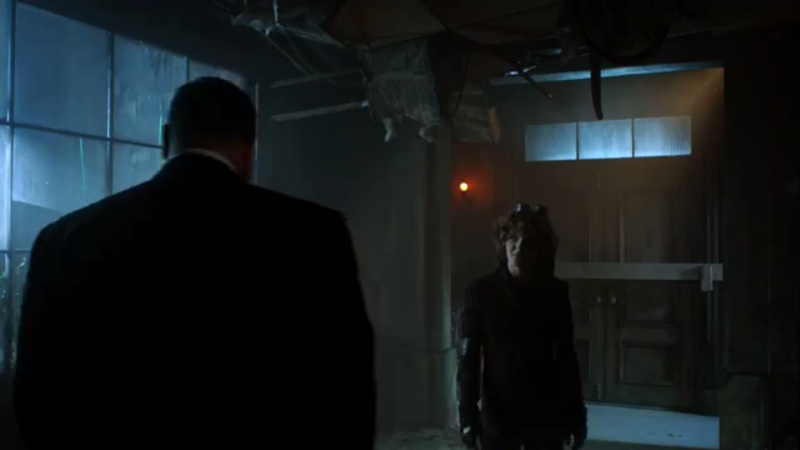 Like talk to Theo Galavan, who also waltzes into the GCPD like he owns the place. Theo can’t stop thinking about that night at the gala. He’s never killed a man before and he relives that moment over and over. Do those thoughts ever go away? Jim says no, but over time, they lose their power. He tells Theo that he did the right thing. But for Jim, Theo says, he does the right thing every day. He’s a symbol of hope and honor to the people of the city. That’s why he’s here: he wants Jim’s endorsement for mayor. Jim is flattered, but policemen and politics don’t mix. Even still, Jim does still play a role in the policeman’s union. Jim refuses. He doesn’t do endorsements. Theo understands, but he does want Jim to think about it. They can really help each other. Tabitha drops by Penguin’s to talk. The bird has lost a lot of money, but it’s immaterial. Someone close must have betrayed him. Tabitha has a job: addresses of places he’ll burn, starting tonight. Fine, but Penguin needs a trustworthy arsonist. And whoever starts the fires will need a special item. And then we get a scene with Selina Kyle, who is sleeping in a boiler room instead of one of the many locations she can sneak to, when she gets a night visit from Butch. He needs her to take him to the fire bugs in the narrows. Why? She can vouch for Butch. The Pikes are the best arsonists in town, but they’re loyal to Fish Mooney. She’s gone, though Selina is adamant that she’ll be back. Fish loved Selina and is willing to help…for a price that she ultimately doesn’t get. At a location similar to the one where Jonathan Crane had a vision of his wife, Selina reunites with Bridgit Pike, played by Michelle Veintimilla. Selina asks for Bridget’s brothers, Joe, played by Leo Fitzpatrick, and Evan, played by Noah Robbins. They’re pissed at Butch for shooting Fish. True, it happened, but for right now, Butch has a nice job for these guys. They need the best arsonists around. Butch hands the addresses. It’s a lot of work, but it’s for a lot of pay. 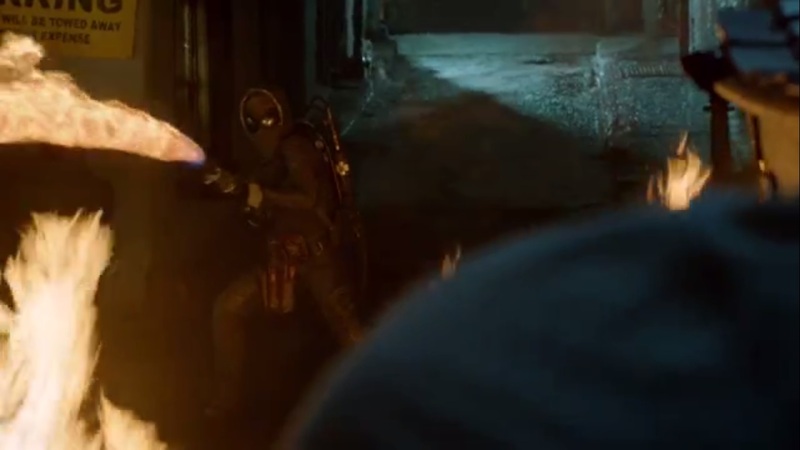 Luckily, the guys have enough firepower to burn Gotham twice. Joe orders Bridgit around and Selina, the only other female around, isn’t a fan of this treatment. But whatever. No time to think about that. Butch hands the brothers a box. Oh, wait, we’re not done yet. Selina speaks with a crying Bridgit outside and tells her to stay strong. We then cut to a factory where the youngest brother, Cale, played by Ari McKay Wilford, loads up on flammables and explosives. One of them is a tad expensive, but that’s why we have robbery. Unfortunately, the GCPD happen to arrive. Cale rushes out, but runs into a dead end. As he pulls out a gun, Barnes and Gordon open fire. Their bullets are so damn powerful that the poor guy explodes! 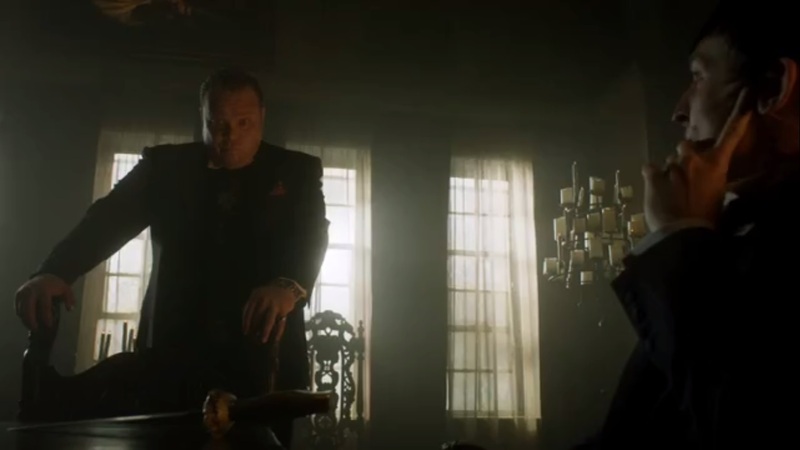 Okay, Gotham, you can’t ask anyone to take you seriously after that. Time for double date night, with Nygma talking too much about melted cheese and Kristen just wanting to eat. Jim finally enters after his explosive day. Leslie finds it odd that Nygma is maintaining this strange sort of cool. There’s apparently a lid for every pot. 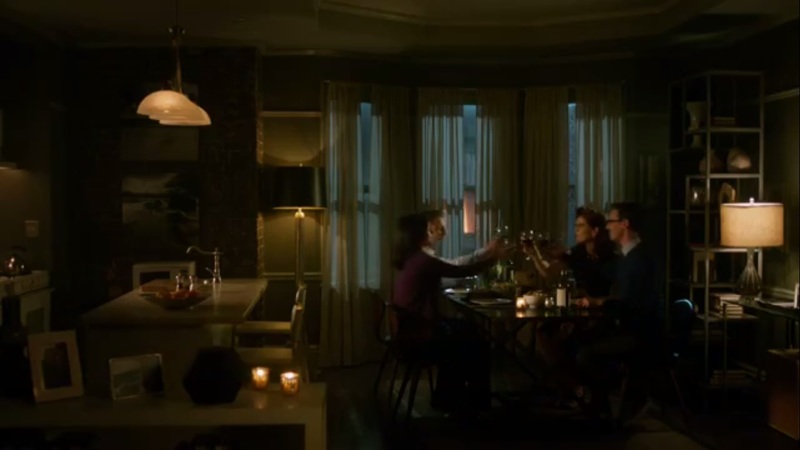 Since Jim has arrived, Nygma proposes a toast: the less you have, the more they’re worth. To friends. Here, here. At the hideout, Joe and Evan lament Cale’s explosive death. They need another body and it’s time for Bridgit to get a promotion, but she doesn’t like fire. Bridgit insists that she’s not their family, but Joe reminds her that she’s got no one else right now. Her mother was a ho and she’s dead. Joe and Evan put a roof over her head. If she won’t cooperate, then Joe considers tricking Bridget out. Does she want to be a whore or with family? Jim lets Leslie know that he couldn’t endorse Theo. He may like Theo, but that doesn’t matter. He doesn’t endorse politicians. Leslie believes that people look at Jim as a respected figure, but he treats that like a burden. It could be a source of pride if Jim just let it. And that is Leslie’s diagnosis. So since Bridgit chooses family, she begins by setting fuses in one of the buildings, all while receiving instructions from Joe and Evan. As she gets out the flame, she learns that she has a minute and a half to get out before things go boom…but there’s one more thing to do. The safe on her right? Get to it. She takes out the box and we learn what’s inside: an eye. Bridget puts it to the center and we learn that this is, indeed, Bunderslaw’s eye. However, that’s where the instructions stop. Bridget grabs the knife inside the safe. Now it’s time to get the hell out, but she forgets the eye. She manages to escape, but not before her leg catches a bit of fire. Joe and Evan are more concerned with hitting the remaining four spots. 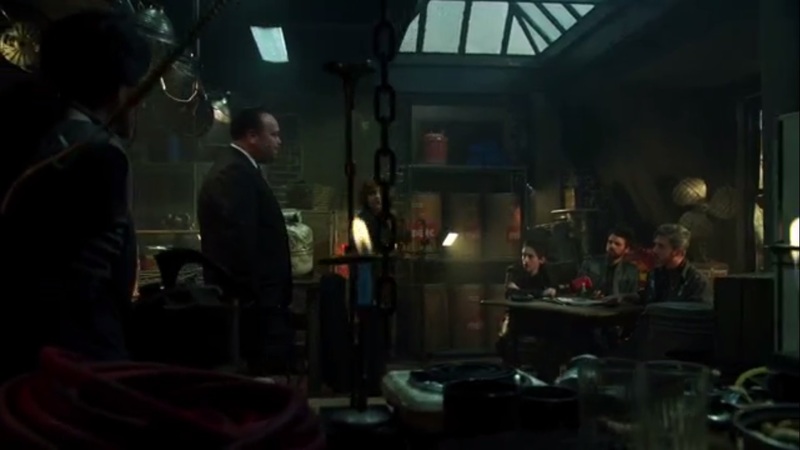 At GCPD, Barnes and the team learns of the five fires. The lab analysis confirmed that the fires were started with thermite and high-end accelerants, so the team is looking for a professional arsonist. Why would a pro do five jobs in one night? Hell, what if they’re not done? 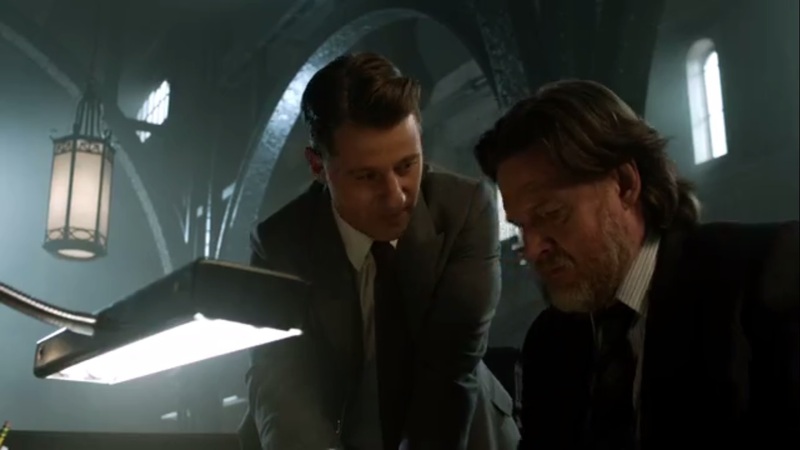 Barnes tells Jim to find a pattern before Gotham burns to the ground. Bridgit goes through a bunch of gear and begins assembling her supervillain suit. As she puts it together, Selina arrives to pick up the knife for Penguin when she learns that Bridgit got burned during her first assignment. Selina warns Bridgit to be careful, though Bridgit insists that she’s doing the family business. Selina strikes back, saying that these brothers aren’t Bridgit’s family. Look at Selina. She’s as free as a cat! But Bridgit remembers a time when she was little. Selina used to show up at the Narrows to look for her mother. Selina gets defensive about this. Bridgit asks what good is freedom if she’s alone, and Selina responds by asking what good is family if you’re a slave. I have a question: what good is uninteresting drama if I don’t care about either of the characters? 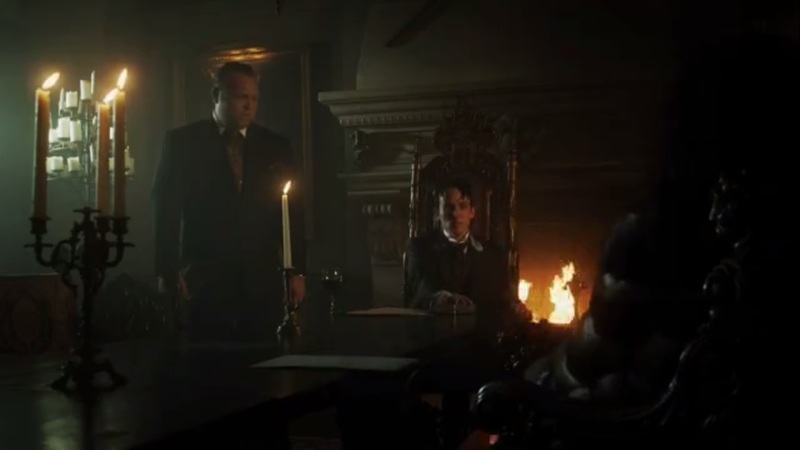 Meanwhile, Penguin notices that the Wayne Family Crest is on the bottom of the blade. Why, he wonders, does Galavan want an antique knife that belonged to the Waynes? There has to be something to understand Galavan in order to beat him. Butch says to talk to Edwige, who runs the old antique shop in Butch’s neighborhood. She knows things. We then meet Edwige, played by Mary Joy, who knows the knife, but can’t help. Penguin senses her fear. If there’s one thing he knows, it’s a liar. So what’s the deal with the blade? This knife has a cursed history- almost 200 years ago, it was used in a terrible crime. Back then, five families ruled Gotham’s high society: The Elliots, the Kanes, the Crownes, the Dumas, and, the most powerful of them all- the Waynes. How could you have missed that one? Back then, people called Celestine Wayne the crown jewel of Gotham. She was promised to the eldest son of the Elliot family, but another coveted her: Caleb Dumas. One night, during an Easter party at Wayne Manor, Celestine and Caleb went missing and were later found in an illicit embrace. Celestine swore on her mother’s grave that Caleb had forced himself on her. Women. Am I right? So Celeste’s brother, Jonathan, hacked off Caleb’s right hand. The Waynes went mad with rage. They seized the Dumas’ holdings and banished them. Caleb Dumas went into exile overseas, to a penitential religious sect founded by his family’s patron saint. Celeste, meanwhile, died an old maid. The Waynes forbade the press from even mentioning the Dumas. They then wiped the Dumas family out of Gotham City’s history. The remaining Dumas were forced to change their name. To what? Galavan. Like the fella running for mayor. And that’s why Edwige is afraid of this knife. She fears that Penguin is getting in deep waters. Luckily, that’s where penguins thrive. 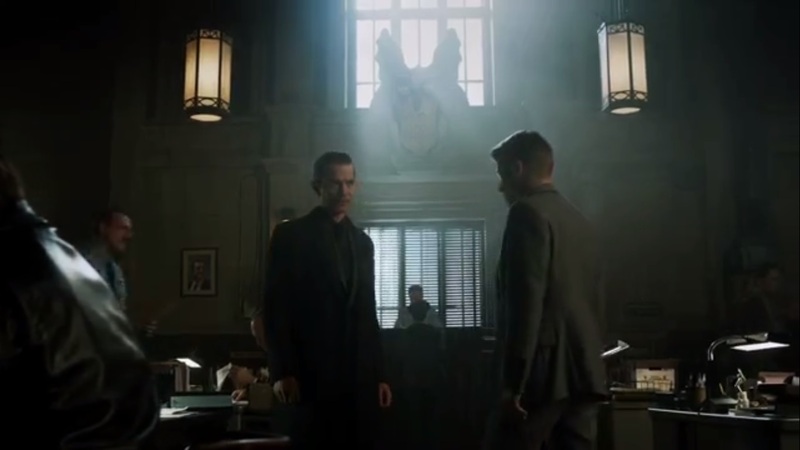 At GCPD, Jim tells Bullock that all the buildings that burned down had one landlord: Wayne Enterprises. If the arsonists stick to their pattern of moving east to west, there’s one obvious target that they may hit tonight: Gotham City Book depository. I thought we were past Jim’s random hunches. Penguin and Butch prepare to have a drink. Butch doesn’t want to, but Penguin insists. 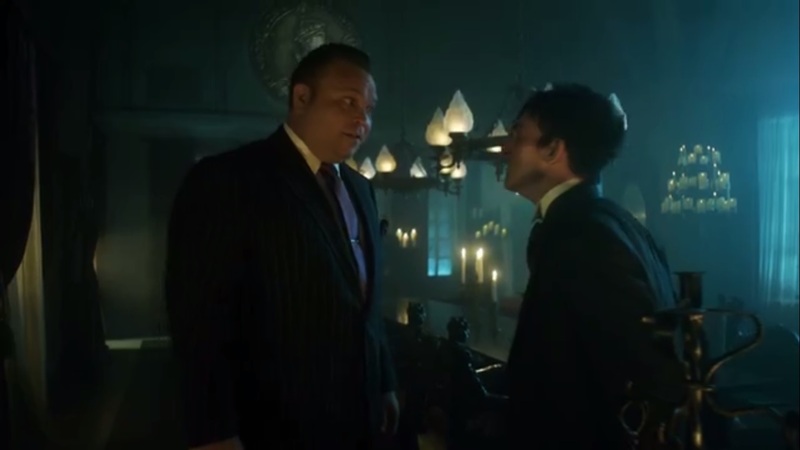 You don’t say no when Oswald Cobblepot offers you a drink. 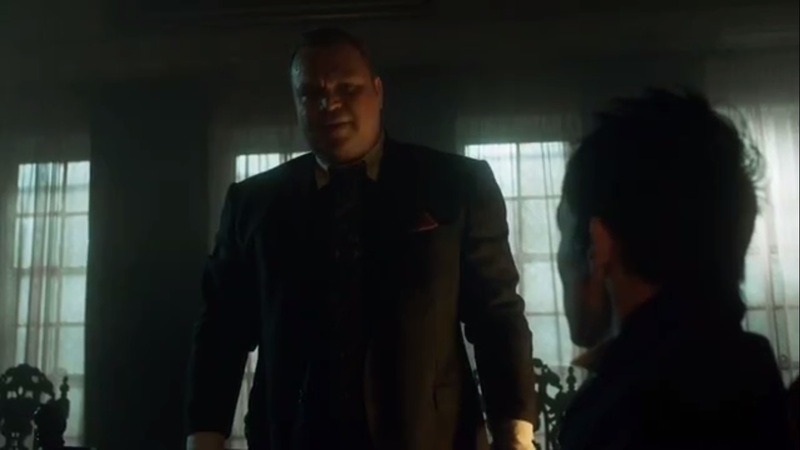 Butch can’t refuse, but he knows that Oswald sounds a bit paranoid. How can he be normal when his mother is out there? Maybe he is going mad. That or he found Galavan’s weakness: the knife that maimed his ancestor. This is a blood feud against the Waynes. Galavan is acting out of emotion and that can be manipulated. Butch is to go to Galavan and say that Penguin went nuts and accused him of setting up the count shop raid. Once Butch is in Theo’s good graces, he’s to find Penguin’s mother and rescue her. This is a basic plan, Butch says, and Theo is a smart man. How do you get around that? Penguin isn’t worried. 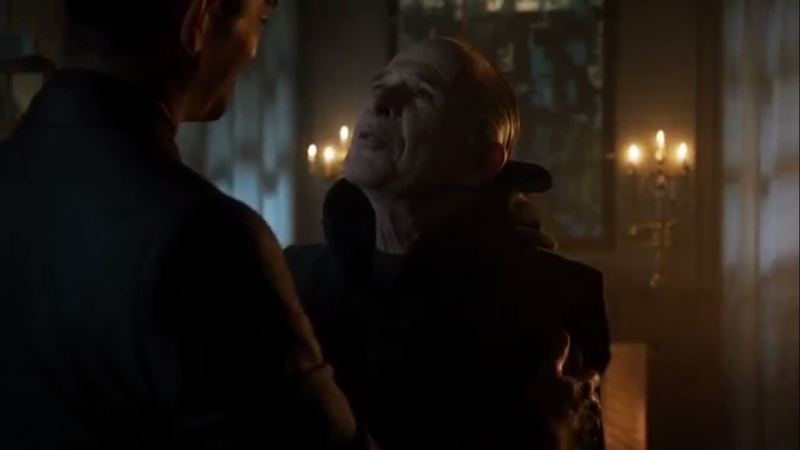 He believes that Theo will assume Penguin knew that Butch turned traitor. Penguin has sold his paranoia, but now he needs to sell Butch. How? Well, Penguin can hack off Butch’s hand, for one. Stakeout time. A van pulls up to the depository. Jim and Bullock make their move- with Selina having nothing else to do but also keep watch from above. Jim orders all units to converge just as Bridgit, in her completed costume, is abandoned by her brothers. She begins burning the area all around her, but the weapon jams. In the process, she even sets fire to Luke Garrett in the process. So the point of Selina being here was to help take Bridget home. Again, am I supposed to care? 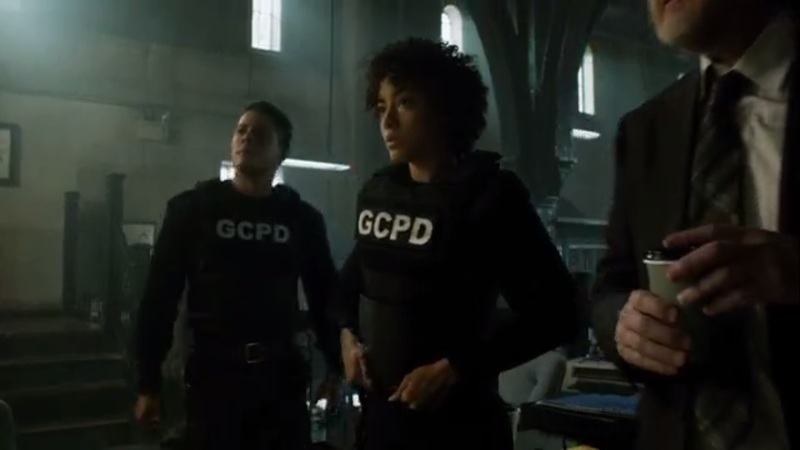 And how did no one from the GCPD arrive in time to stop her? Where’s the rest of the team? 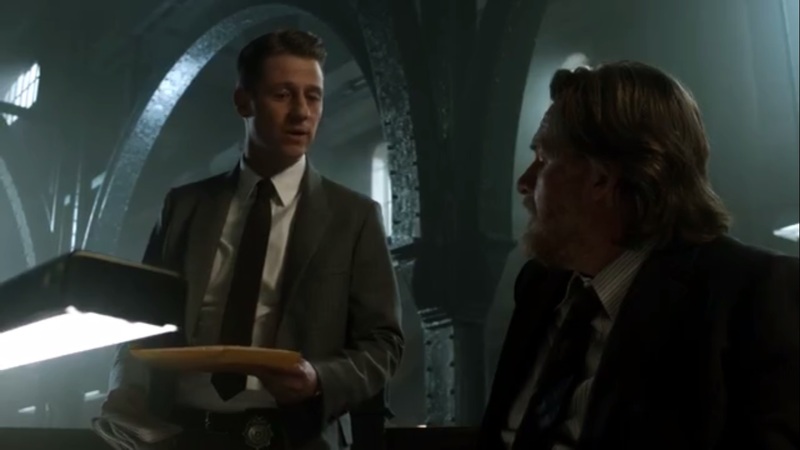 At GCPD, Theo stops by again just as Barnes announces that Luke Garrett has passed away. GCPD will mourn him, but not now. There is a cop killer on the loose and the person responsible will pay, with every legal method at their disposal. Jim heads over to Galavan and tells him that bad guys aren’t playing by the old rules anymore. The police need every method at their disposal, and not just more guns. Jim doesn’t know how bad this will get, but if he has Theo’s word that they won’t face this alone, Theo will have Jim’s endorsement. Theo promises to provide everything that Jim needs. The two shake hands. That seals the deal. That evening, Theo finds a figure in a black robe waiting for him: Father Creel, played by Ron Rifkin. It’s been a long time. Father Creel is glad that Theo has surrounded himself with luxury, but Theo has to play the part, especially now that he has the blade. However, Theo does not have the Wayne boy yet, but soon. After almost 200 years, this family can be patient. The day of redemption is coming. Gotham will be redeemed in blood and Bruce Wayne will die. No, he won’t, but sure. So, this was an episode. 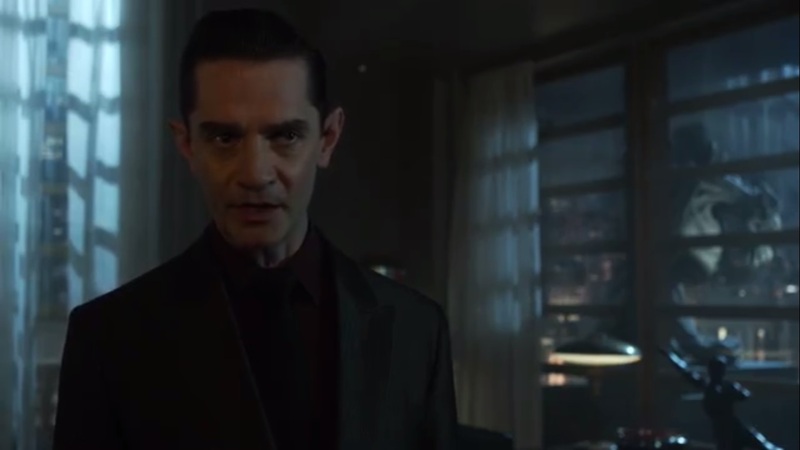 And to be frank, even though we’re continuing with this whole “Rise of the Villains” storyline, the new villain introduced isn’t all that interesting or even as engaging as Theo Galavan’s plan. Really, the Bridgit stuff feels like an afterthought because it’s mixed in alongside Penguin’s plan to get revenge against Theo, Barnes dropping the hunt for Penguin to pursue this arsonist, Nygma’s double dinner date, the flashbacks to early Gotham, Father Creel’s sudden appearance…not that this episode felt overstuffed, but much of it just didn’t feel important. Given how we were introduced to the Strike Force just one week prior, I figured that this episode would follow up on their introduction and allow us to get to know them as characters. In addition, we met them all at once and know next to nothing about their individual personalities. This may sound like I’m rewriting the show, but why introduce Barnes and this new Strike Force team if we’re immediately going to shift gears to another new villain? 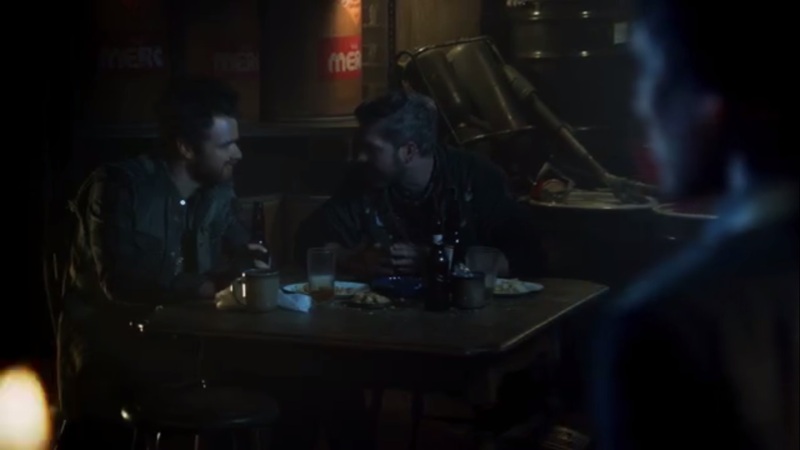 The stuff with Galavan has played against the rest of the season’s storyline, so I’m fine with that continuing throughout, but if we’re going to bring in Firefly, this episode may as well have just brought in Strike Force as new cadets all at once because I don’t feel any attachment to them. And this is what makes Luke Garrett’s death all the more ineffective. We know about as much about him as Gordon did and already one of these new recruits is dead. Introducing him in the previous episode, telling us little about him, and then killing him off isn’t good writing. It feels like a way to just thin the crowd. Let’s say Luke pulled through his injury, lived to fight another day, and promised to become a better officer. That is character development. Plus, he just rushed in to attack a perpetrator with a weapon. A flamethrower at that. Not the smartest idea. But I don’t feel the weight of his loss because I don’t know him. Even more confusing is why the hell Barnes now shifts gears towards catching this pyromaniac. After all, what happened to his grand plan of taking down the Penguin? Now his plans have changed because Bridgit killed someone? Stick to something. Or at least still divert resources to pursuing Penguin. 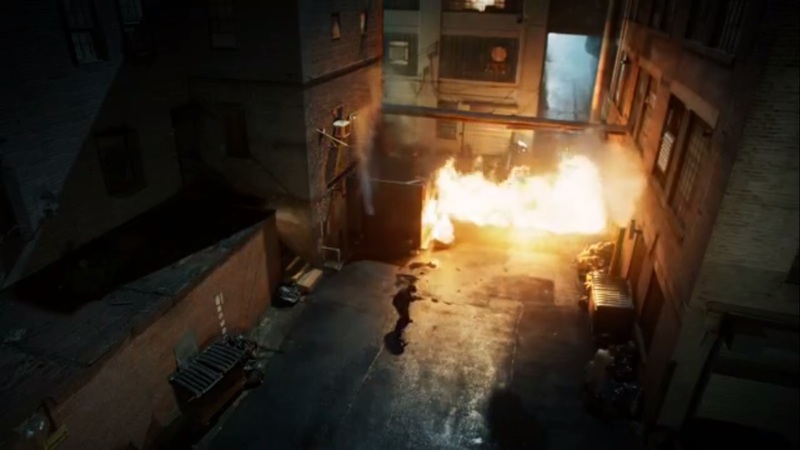 Hell, we got a taste of that when GCPD raided the count house, but that was the end of it. The early half of Season One had Jim make one too many convenient hunches when it came to cracking a case. The show gradually grew away from that and I had hoped the trend would continue, but now it’s too easy for Jim to think that just because the arsonists are going in a pattern that they would target the building that he thinks they will. This is Gotham City. Like he said, criminals don’t play by the old rules, so it’s a massive shot in the dark for him to think the depository is the next target instead of doing something random. 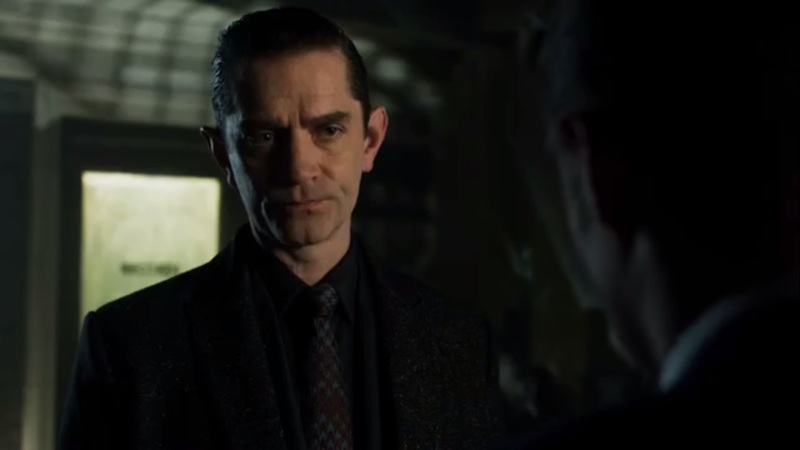 Right now, he doesn’t sense anything sinister about Theo Galavan. He just needs backing to ensure that the police have every method at their disposal to deal with criminals. Is Jim doing this out of desperation? If so, seems like he’d just fall back on Penguin again for assistance or the occasional muscle. But because Theo presents himself as an upstanding figure and outsider, just like Jim, he feels the two have a connection. He’s embracing that pride and respect that Leslie wanted him to let in, but for the wrong person, like a deal with the devil scenario. Theo, meanwhile, has a grand plan that boils down to a beef with the Wayne family. He’s motivated to restoring the honor and pride of his family legacy. And we’ve seen that he has the money and resources to do so. Why he even bothers with Penguin is anyone’s guess when he has Tabitha and Barbara at his disposal, not to mention Aaron Helzinger is still out there. 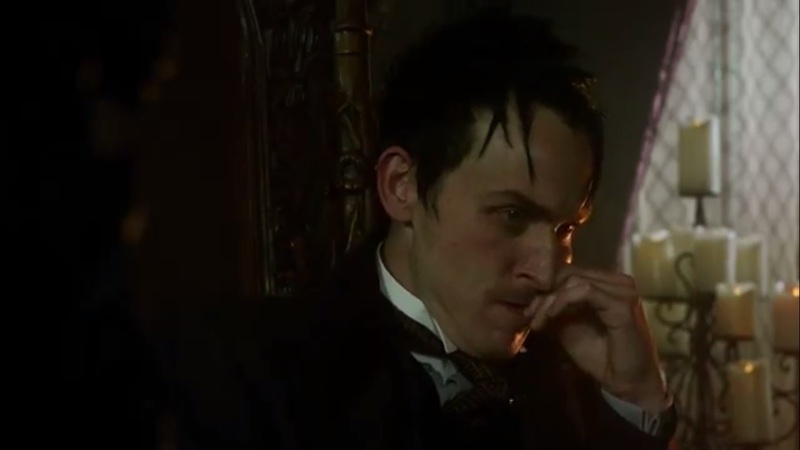 But if he didn’t need Oswald, there’d have been no reason to kidnap his mother, I suppose. However, if the show believes that we should be holding our breath in suspense at the idea that Bruce Wayne will die at this point, it has another thing coming. The Wayne history presented in the flashbacks, to my knowledge, is original. And I’m fine with the show going its own way so long as what we get is compelling. Right now, this isn’t and if the Waynes had such a stranglehold on influence in Gotham City, then I suppose it’s no surprise the family has so many secrets. I…really don’t have much to say about the origin story for Bridgit. Like Bruce, Selina, Jerome, Ivy, Jonathan Crane and so on, she’s another character with a messed up childhood and mixed motives. She’s complacent with helping out her family, but one pep talk from Selina Kyle is enough to make her second guess herself? Even then, she still suits up and becomes a supervillain. The show makes a point of saying that Bridgit and Selina Kyle have a history, so if Bridgit was so sick of her brothers, leave and go live with Selina. Not that Selina’s life is any better, because it isn’t, but she’d be playing by her own rules. The argument between the two felt very forced. Who is Selina to call someone a slave for taking orders just to get by, when she takes her marching orders from Penguin? 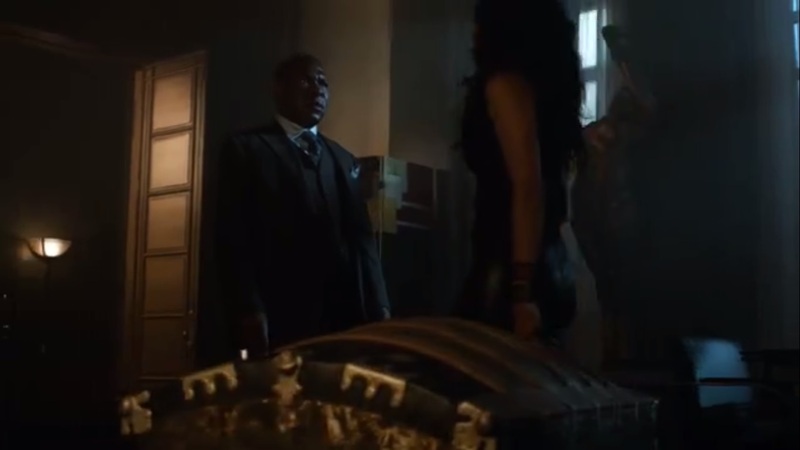 And before that, Fish Mooney, who she barely knew. 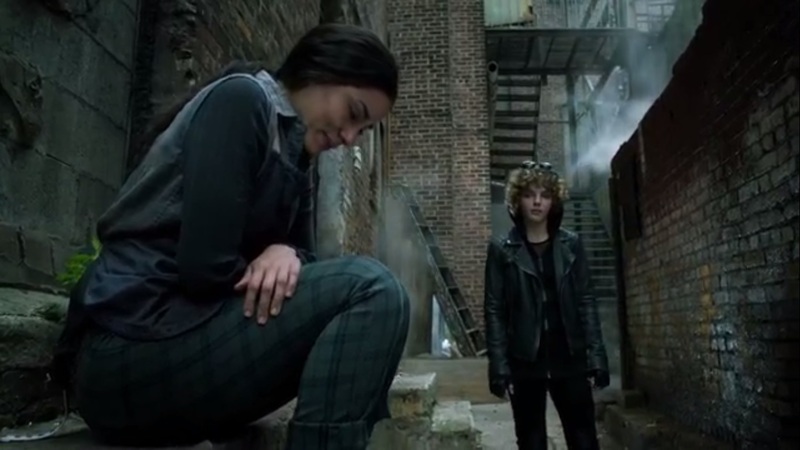 And when did Fish and Selina become such fast friends in the span of one episode? 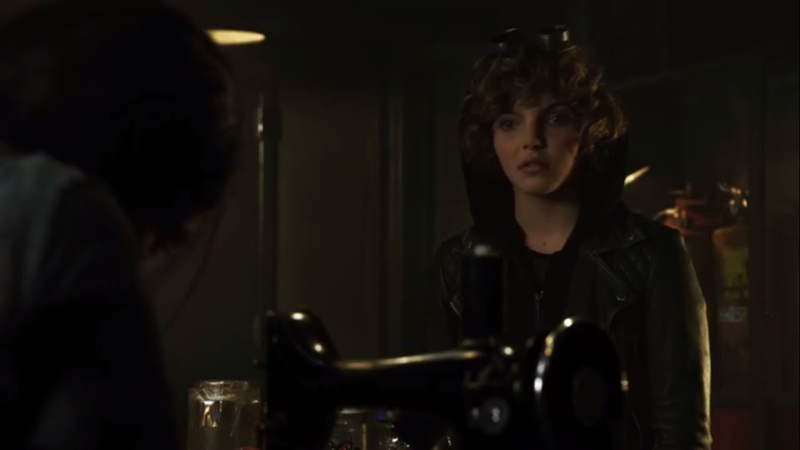 Until the Season One finale, Selina operated on her own. But now she has this reputation of being good chums with Fish Mooney. Penguin’s desperation was the closest we got to an interesting subplot. He wants to save his mother, so he’s sending Butch down the same path he walked when he became Falcone’s mole and infiltrated Maroni’s inner circle, all while making it appear that he still worked for Fish. We’ve come full circle with Butch taking up the mantle and I buy that Penguin would be crazy enough to hack off Butch’s hand just to keep up appearances. 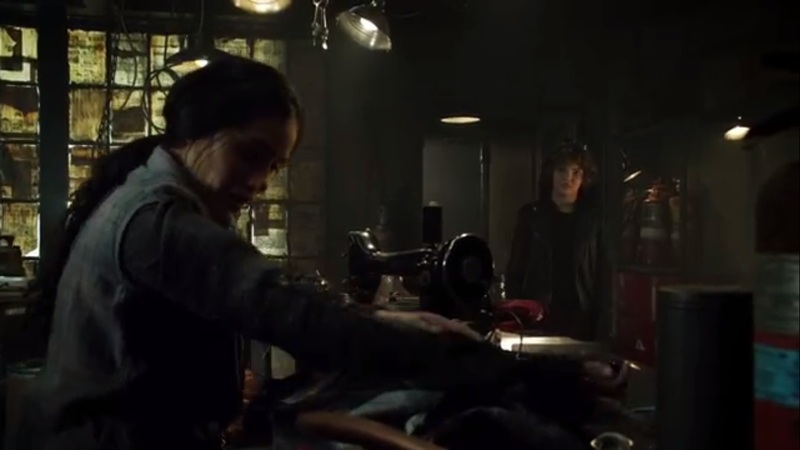 Again, I find Penguin at his best when he’s maniacal, and it’s a gamble to risk this move all on Theo not showing as much love for his sister as Penguin does for his mother. But at this point, he finds that he has few options. Oh, but this episode did make me laugh for a solid minute when Cale exploded. So cartoony. Either Jim has expert aim or Cale had explosives all over him. Either way, I laughed. 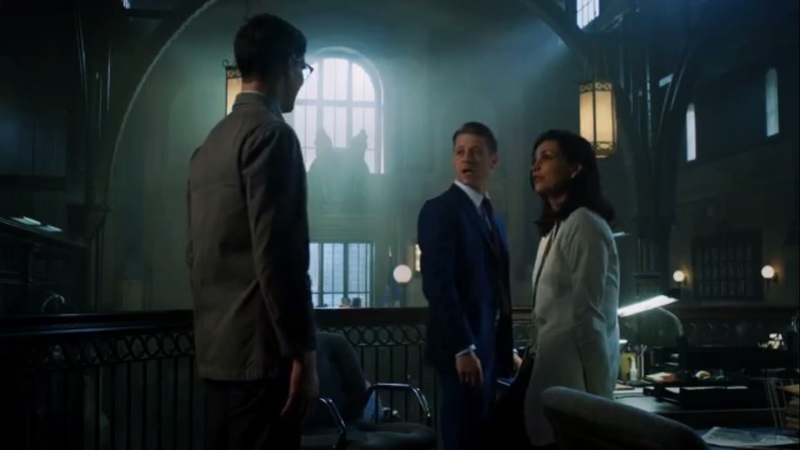 Gotham has been decent so far in its second season run, but with “Scarification,” the show is sliding back into that mediocrity that plagued its first season. I feel nothing for Luke Garrett’s death, I don’t find Bridgit interesting as a character or villain, I don’t need Jim to get random hunches again, and I can do without a double-talking Selina Kyle. But hey, looks like a multiple episode arc, so maybe things will pick up later. 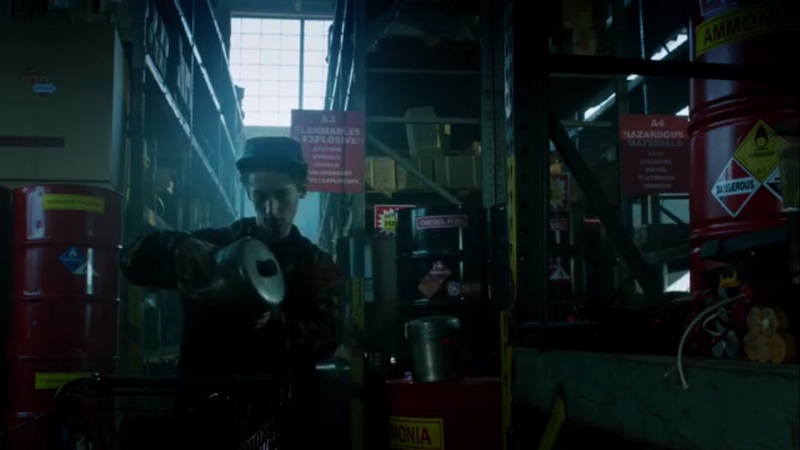 This entry was posted in Gotham and tagged Ari McKay Wilford, Ben McKenzie, Bill Eagles, Bridgit Pike, Butch Gilzean, Cale Pike, Carl Pinkney, Chelsea Spack, Cory Michael Smith, Donal Logue, Dr. Leslie Thompkins, Drew Powell, Edward Nygma, Evan Pike, Father Creel, Firefly, Gotham, Harvey Bullock, Ian Michael Quinlan, James Frain, Jim Gordon, Jordan Harper, Josie Mac, Kristen Kringle, Lenny Platt, Lucas Salvagno, Luke Garrett, Michael Chiklis, Michael Potts, Michelle Veintimilla, Morena Baccarin, Nathaniel Barnes, Noah Robbins, Oswald Cobblepot, Paulina Singer, Penguin, Robin Lord Taylor, Ron Rifkin, Sal Martinez, Sid Bunderslaw, Theo Galavan by omarid513. Bookmark the permalink.